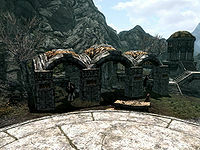 Markarth Stables is a stable located outside Markarth, opposite the entrance. A black and white horse may be purchased here for 1000 Septims from Cedran and a war dog follower named Vigilance for 500 septims from Banning. They both live at the stables along with Vigilance unless you have bought him. There is a row of pillars in front of the building supporting a stone porch area where the horses that are for sale are kept, there are several bales of straw for them to used for bedding. To the northwest and also behind the building to the northeast are two Juniper Berry Trees and to the southeast is a lookout tower manned by a Markarth Guard with flights of stairs leading up to it. During the day one or both of Cedran and Banning, along with Vigilance will be stood leaning against or near the pillars out front. The entrance is normally novice-locked. Through the door is a flight of stairs down to the east. There are stone shelves on either side at the bottom with an iron dagger, a leather strip and a bucket containing a cabbage on top of the shelf on the left and a woodcutter's axe is on top of the shelf to the right. There is a doorway in front of you leading into the single-roomed dwelling. There is a rabbit and bulb of garlic on a block of wood on the left and a cooking pot on a stand beside the north wall, with a leather strip on a shelf beside that. To the right, still against the north wall is a bucket containing a potato and two leeks and a kettle further to the right against the same wall containing two cabbages and a potato, with a red apple, a carrot and two potatoes (one in a basket) on a wall shelf on the north wall. Coming out from the same wall is a long wooden table with two chairs. On the table is a baked potato, a portion of grilled leeks, a sheaf of wheat, a rock warbler egg and several pieces of cheese. To the east there is a large wall shelf above several bales of straw with a three food barrels and a basket containing two cabbages and a gourd. To the south is a raised section with three stairs up to two owned single beds. To the right of the stairs is a round wooden table and chair, with two loaves of bread and a goat cheese wedge on top of the table, a food sack on top of a crate beside it on one side and a mead barrel on the floor of the raised section on the other side. There is an unlocked chest on the raised section between the table and wall. One of the beds is along the east wall, while the other is along the south wall. On a wall shelf by the first bed is the business ledger and a bottle of alto wine, with a Crate above the headboard with an apprentice-locked strongbox on top and a food sack and leather strip on a block of wood beside the crate and another food sack with a honey nut treat on another crate by the foot of the bed. There is a goat hide under the second bed. Once you have completed a delivery for Banning you may freely take most items from inside the Stables. If you have also complete the relevant quest to his satisfaction, you can even break in and use lockpicks to break into the strongbox and take all the gold and Banning will not complain or accuse you of trespassing or stealing.